Beautiful - The Musical is On Tour! Beautiful: The Carole King Musical is a jukebox musical with a book by Douglas McGrath that tells the story of the early life and career of Carole King, using songs that she wrote, often together with Gerry Goffin, and other contemporary songs by Barry Mann, Cynthia Weil, Phil Spector and others. 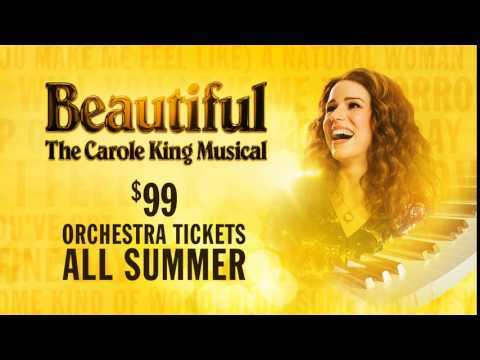 The original production of Beautiful received its world premiere at the Curran Theatre, San Francisco, in October 2013, with direction by Marc Bruni and choreography by Josh Prince, and starring Jessie Mueller and Jake Epstein as Carole King and Gerry Goffin, respectively. It made its Broadway debut at the Stephen Sondheim Theatre in January 2014. A West End production starring Katie Brayben as Carole began in February 2015. A U.S. tour launched in September 2015. Beautiful: The Carole King Musical had a pre-Broadway try-out in San Francisco, California, at the Curran Theatre from September 24, 2013 through October 20, with an official opening October 8. The production was staged by Marc Bruni, with choreography by Josh Prince and musical direction by Jason Howland. Jessie Mueller played Carole King. The musical sold out its entire run at the Curran Theatre. The musical opened on Broadway at the Stephen Sondheim Theatre on January 12, 2014, after previews from November 12, 2013. In addition to Mueller as King, the cast features Jake Epstein as Gerry Goffin, Anika Larsen as Cynthia Weil and Jarrod Spector as Barry Mann. King attended the April 3, 2014 performance and appeared on stage with the cast at the curtain call, singing "You've Got a Friend" together with them. A production in London's West End opened on February 25, 2015, following previews beginning February 10, 2015, at the Aldwych Theatre. Prior to the announcement, Baz Bamigboye from the Daily Mail reported that producers are looking for a full British cast for the transfer, meaning that Jessie Mueller would not transfer for the London production. On September 25, 2014, it was announced that British actress Katie Brayben would take the lead role of Carole King, with further casting including Alan Morrissey as Gerry Goffin, Gary Trainor as Don Kirshner, Glynis Barber as Genie Klein, Lorna Want as Cynthia Weil and Ian McIntosh as Barry Mann. Beginning November 30, 2015, Cassidy Janson took the lead role of Carole King and Diane Keen replace Glynis Barber in the role of Genie Klein. The musical began a U.S. tour starting in September 2015 in Providence, Rhode Island, at the Providence Performing Arts Center, with engagements across the United States, ending in San Francisco in August 2016. The role of Carole King will be played by Abby Mueller (the sister of Jessie Mueller), with Liam Tobin as Gerry Goffin and Becky Gulsvig as Cynthia Weil. At Carnegie Hall in 1971, Carole King sings "So Far Away". Then, in Brooklyn 1958, 16-year-old Carole tells her mother, Genie, she is going into Manhattan to try to sell a song to music publisher Donnie Kirshner. In the long tradition of mothers, Genie is opposed to her daughter's wish and in the equally long tradition of teenagers not caring about their mother's opinion, Carole goes anyway. At 1650 Broadway, she hears the "1650 Broadway Medley". She then sings her new song "It Might As Well Rain Until September". Donnie says he will take it and hopes she has others. At Queens College, Carole meets a handsome young lyricist named Gerry Goffin. They agree to collaborate, musically and romantically, which in both cases turns out to be a fertile arrangement. When they go to Donnie's to play their new song, Carole confesses to Gerry that she is pregnant. Gerry asks her to marry him. It gives her an extra depth of feeling when she sings their new song for Donnie, "Some Kind of Wonderful", which The Drifters then record. They get an office at 1650. While there, Carole meets a new lyricist Cynthia Weil ("Happy Days Are Here Again"), who is looking for a composer to work with. Gerry and Carole sing their new song "Take Good Care of My Baby", during which Barry Mann, the composer with the office next door, enters. Barry meets Cynthia and they decide to collaborate. As they begin to work, sparks fly. Donnie tells them he needs a song for the Shirelles. The couples compete for the job. In Donnie's office the next morning, Carole and Gerry present "Will You Love Me Tomorrow". Cynthia and Barry perform "He's Sure the Boy I Love". Donnie picks Carole and Gerry's song for The Shirelles and it goes to no. 1 ("Will You Still Love Me Tomorrow" (Reprise)). And so, on either side of the same wall, a competition is born. The two teams turn out an amazing parade of songs: "Up on the Roof", "On Broadway", "The Loco-Motion" and "You've Lost That Lovin' Feelin'". Gerry and Carole are at the taping of a TV special where their new song, "One Fine Day", is being performed by the dazzling Janelle Woods. During a break, Gerry confesses to Carole that he is restless in their marriage. He wants to sleep with Janelle, and he doesn't want to lie about it. Carole is stunned. As the song begins again, she takes it over and sings it herself. Carole is in a recording studio doing a demo of "Chains". Gerry is off with Janelle but tells her he will meet her later. Nick, a guitarist, asks Carole to come sing at the Bitter End sometime but she declines — she's a songwriter, not a singer. The thing with Gerry is getting her down so she goes and talks to Cynthia who is also having trouble with Barry — they split up. Carole decides to tell Gerry he has to end the affair with Janelle. As she leaves, Barry comes in. He and Cynthia make up and play their new song, "Walking in the Rain". Gerry shows up, but he is not making sense. He eventually has a breakdown. At the hospital, he tells Carole he will end the affair with Janelle and that he wants to come home. She suggests they make a new start and move to the suburbs ("Pleasant Valley Sunday"). Barry, Cynthia and Donnie come to see the new house. Barry plays their new song, "We Gotta Get Out of This Place". Depressed that he and Carole can't do as well, Gerry leaves in a funk for the city. While he is gone, it comes out that Barry and Cynthia have seen him with another woman, a singer named Marilyn Wald. Carole goes to Marilyn's apartment and Gerry is there. It's the final straw, and she ends their marriage. At the Bitter End, where Barry and Cynthia hear their song "Uptown", Carole explains she went to Los Angeles for a vacation and has started writing on her own. Nick, the guitarist from the studio who asked her to sing with his group, is playing there and urges her to sing. She sings her new song, "It's Too Late". She decides to move to Los Angeles. At 1650, she says goodbye to Donnie, Barry and Cynthia and plays them a parting present ("You've Got a Friend"). In Los Angeles, she records her album, Tapestry. The session goes well until the last song, which she is afraid to sing. It's a song she wrote with Gerry and she is afraid of the feelings it may stir up. Her producer, Lou Adler, persuades her. She sings "(You Make Me Feel Like) A Natural Woman". The album is a smash. Carole is at Carnegie Hall for her concert. Before the show starts, Gerry knocks on her dressing room door. He has brought her a good luck present, but has something even more valuable: an apology for all the ways he hurt her. With a full heart he wishes her well. Carole comes onto the stage of Carnegie Hall alone. She sits at the piano. Then with all the joy inside her, she sings "Beautiful". † Not included on the original Broadway Cast Album. The musical uses a 12-member orchestra consisting of three keyboards, two guitars, bass, drums, percussion, two reeds, trumpet/flugelhorn, and trombone/bass trombone. In addition the performer playing Carole King plays the piano if it is Katie Brayben (London) whereas Jessie Mueller (Broadway) needed piano lessons so she could mime. The Broadway cast album was recorded in February 2014 by Ghostlight Records and was released in digital form on April 1, 2014. It was in stores as of May 13, 2014. (The Broadway cast album includes the song "You've Got a Friend", although that song is not listed in the opening night credits.) The album was also released on a vinyl format. Scott J. Campbell took over the role of Gerry Goffin from Jake Epstein on September 23, 2014. Paul Anthony Stewart took over the role of Don Kirshner from Jeb Brown on September 23, 2014. Chilina Kennedy took over the role of Carole King from Jessie Mueller on March 7, 2015. Jessica Keenan Wynn took over for Anika Larsen in the role of Cynthia Weil while she was on temporary maternity leave starting on March 10, 2015. Anika Larsen returned to the role of Cynthia Weil on October 13, 2015. Ben Jacoby took over the role of Barry Mann from Jarrod Spector on March 3, 2016. Jessica Keenan Wynn has returned to the role of Cynthia Weil on April 26, 2016, replacing Anika Larsen. Cassidy Janson replaced Katie Brayben in the role of Carole King on November 30, 2015. Diane Keen replaced Glynis Barber in the role of Genie Klein on November 30, 2015. Ben Brantley, reviewing for The New York Times, called the musical a "friendly, formulaic bio-musical". He wrote that the musical shows the change in King from a modest songwriter to the popular and confident performer of those songs, showing the "real, conflicted person within the reluctant star." Jesse Green, in his review for the New York Magazine, praised the performers but criticized the book, writing that the musical does not have the "dramatic coherence of book biomusicals". Similarly, Elyse Sommer, in her review for curtainup.com, praised the performers, especially Mueller, Spector and Larsen, as well as the "shimmery lighting" and the costumes. She wrote that while the musical "doesn't hang its songs on the greatest or most suspenseful story ever told, it has enough bounce and Broadway show glitz to keep you in your seat". On March 22, 2015, it was announced that Sony Pictures would be bringing the musical to the big screen with Douglas McGrath adapting his book into a screenplay and stage producer Paul Blake producing through Tom Hanks and Gary Goetzman's production company, Playtone. The producers of the original Broadway production include: Paul Blake, Sony/ATV Music Publishing, Jeffery A. Sine, Richard A. Smith, Mike Bosner, Harriet Newman Leve, Elaine Krauss, Terry Schnuck, Orin Wolf, Patty Baker, Roger Faxon, Larry Magrid, Kit Seidel, Lawrence S. Toppall, Fakston Productions, Mary Soloman, William C. Cohen, John Gore, Barbara Freitag, Loraine Alterman Boyle, Matthew C. Blank, Tim Hogue, Joel Hyatt, Marianne Mills, Michael J. Moritz Jr., StylesFour Production, Corey Brunish, Brisa Trinchero, Jeremiah J. Harris, Sherry Kondor (Executive Producer), Christine Russell (Executive Producer). Beautiful - The Musical has no reviews.